The funerary temple of Jayavarman II and his predecessors, enclosed within a moat of 400 by 500 meters. The foundation stele (an inscribed monolith) tells of the genealogy of Indravarman I, with a reference to the cult of the god king, and the foundation date of three statues of Shiva and Devi in 879 AD. The other face of the inscription dates from 893 AD under the reign of Yasovarman and describes certain dedications. The temple still has a large area of molded stucco (a lime-based plaster mixture) remaining intact. A temple mountain enclosed by a Laterit wall and two moats, the outer of which measures about 900 by 700 meters. The third such temple after Ak Yum and Rong Cheng (at Phnom Kulen to the north east) and the first to make extensive use of sandstone. The stele tells of the foundation of the linga (a stone phallus, representative of Shiva) in 881 AD. The brick towers have finely detailed sandstone elements and some remnants of stucco molding. The central sanctuary in the Angkor Wat style, which was probably built two centuries after the main temple, was resurrected from a pile of rubble between 1936 and 1943. Four brick towers (though perhaps originally six) set on a two tiered base in the middle of the Lolei Baray, (Indratataka), a large ancient reservoir of 3.8 by 0.8 kilometers. Excavation of the baray began, so the inscription tells us, five days after the consecration of Indravarman I at Bakong, in order to irrigate the capital city centered there. The temple, built subsequently, is dedicated to his memory. Located at the centre of the first capital of Angkor which formed a square of about 4km surrounded by a moat of which the south west quarter is still visible. The remains of an inner enclosure of 650 by 436 meters surround the base of the hill. A ‘natural mound’ five tiered pyramid temple, the bulk of which is hewn from the bed-rock and faced with sandstone. The location gives good views over the surrounding landscape, particularly at sunset. 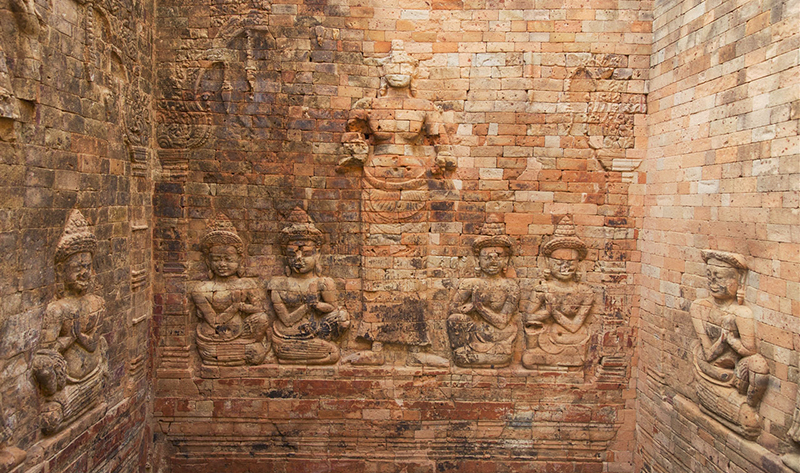 Prasat Kravan, the best temple of brick carving. Five brick towers, aligned north – south on a common brick base, within a single enclosure and moat. The extensive brickwork restoration uses cement mortar where originally there would only have been a thin vegetal adhesive or clay slurry. The inscribed door frames mention the setting of a statue of Vishnu in 921. There are bas-reliefs representing Vishnu, and other representations of Lakshmi in the internal brickwork of the central tower, and of the northern most tower. Best in the morning sun. In the centre of the Eastern Baray and so originally only accessible by boat. All the characteristics of a temple mountain in brick and Laterit but with a three meter high platform carrying five towers arranged in a quincunx rather than a central tiered pyramid. A large foundation stele describes the dedication to the king’s parents. 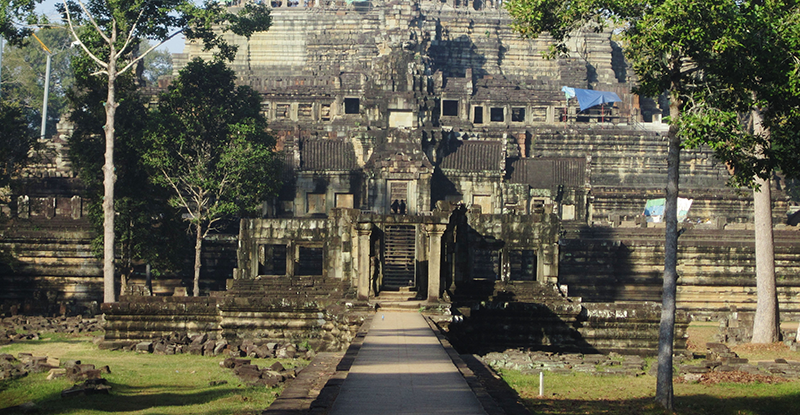 The east west axis of the temple aligns with the principal entry to the royal palace in Angkor Thom. Sandstone lintels are superbly detailed. Monolithic elephants stand at the four corners of each enclosure, those to the south west being particularly well preserved. Good in the late afternoon. On the same north south axis as the Eastern Mebon which it follows by only 9 years. Similar in style and composition, though much grander. Again built almost entirely of Laterit and brick but with the main architectural elements in sandstone. The lintels are finely detailed – some remain unfinished. The upper brick towers would have been adorned with stucco molding. Probably central of the second capital which developed following its return from Koh Ker to where it moved between 921 and 944. It is thought that the royal palace was situated close by. A temple in the forest 25 kilometers to the north east of Angkor Thom. A jewel to which the nature of the material used finely textured rose colored sandstone – is perfectly suited. Monumental size and architectural theme give way to a miniature scale and a dense and exquisite detail in near perfect preservation. Dismantled and reconstructed between 1931 and 1936. An imposing five tier temple mountain built predominantly in sandstone and surrounded by a moat. Perhaps central to the next capital. Best approached from the original eastern entrance where the massive form of the temple is presented framed in trees at the end of the entrance causeway. The clear constructional intention is all the more visible since the decoration was never completed. Inscriptions on door frames of the eastern gopuras relate to dedications made in 1007. Ta Nei was built late in the 12th century. 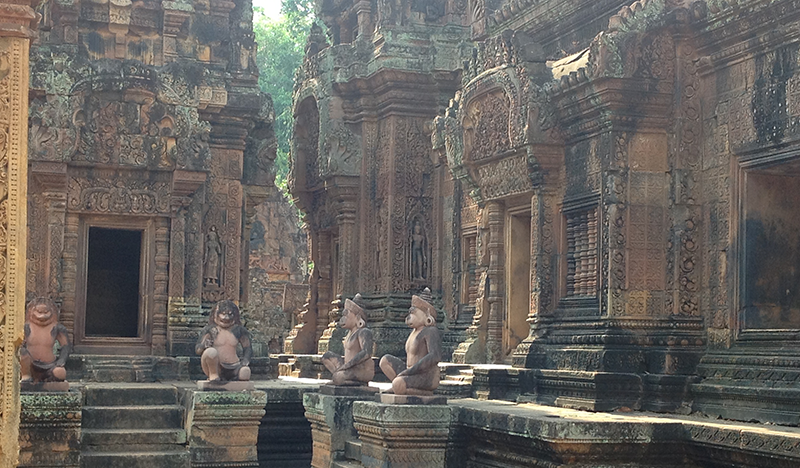 King Jayavarman VII is responsible for the design and construction of the temple. He dedicated the stone monument to the principles of Buddhism. 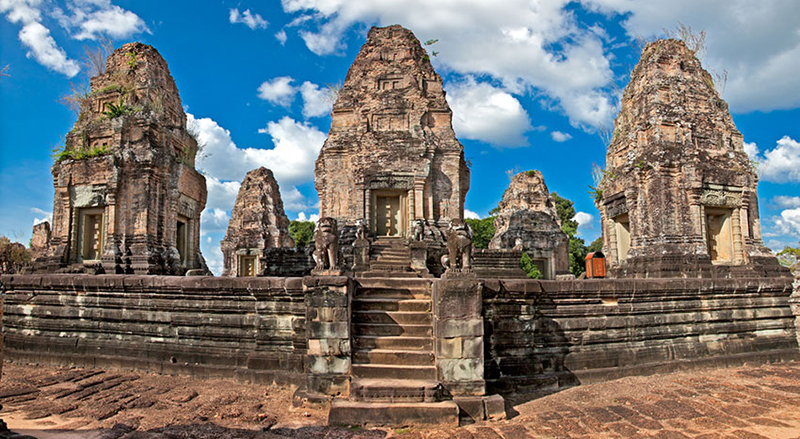 This small temple is located deep in the Cambodian jungle, about 200 meters west of the East Baray. 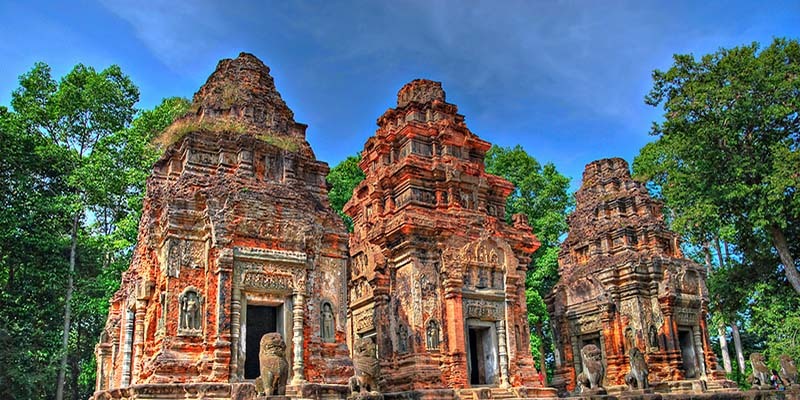 The two Khleangs are similar buildings of uncertain function. The one to the north was built first – two inscriptions date from 1002 to 1049. Inscriptions within the south Khleang are similar to the oaths of functionaries engraved on one of the door jambs of the east gopura of the royal palace enclosure. The Royal Palace of the next capital was enclosed within a five meter high Laterit wall that is doubled by a second of later construction. At the centre of this enclosure is Phimeanakas, a three tiered rectangular pyramid built in Laterit, which was perhaps a private royal chapel. The composition diminishes with height and so gives a false perspective – a characteristic device of the Temple Mountains. A three tiered temple mountain to the south of the Royal Palace enclosure. It is the “impressive copper tower even higher than the tower of gold” (the Bayon) described by Tcheou Ta-Kouan, a Chinese diplomat visiting at the end of the 13th century. Probably the central temple of the fourth kingdom of Angkor. A pyramid temple in three tiers built on an artificial mound with four enclosures and opening unusually to the west, suggesting this was the funerary temple of Suryavarman II. The external wall forms a rectangle of 1025 by 800 meters which is enclosed by a moat 190 meters wide. Overall a square kilometer of bas-relief sculpture to view. Best visit in the late afternoon before dawn. Extensively restored in contrast to Chau Say Thevoda just to its south. A single ruined Laterit wall, 45 by 60 meters, surrounded by a moat and divided by two gopuras encloses both a finely detailed central sanctuary set on a 2.5 meter high molded base and a single library. Similar in style to Thommanon, but in an advanced state of ruin. A raised causeway on three rows of piers links the temple via a cruciform terrace to the river. 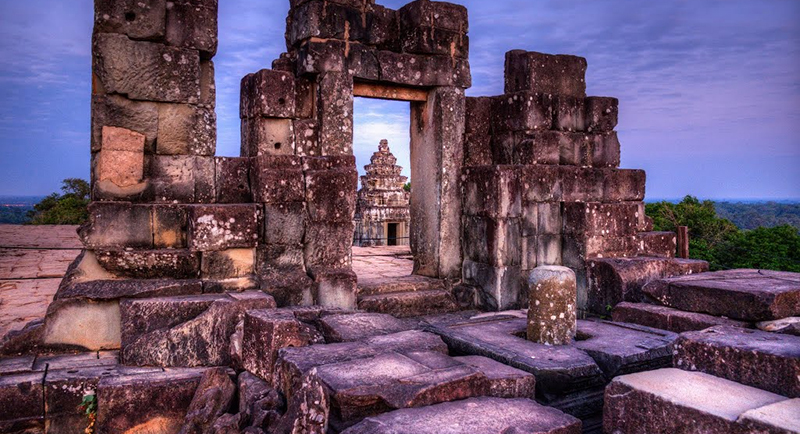 The foundation date is uncertain but the quality of decoration places it, with Thommanon, between the extreme limits of the Baphuon and Angkor Wat style, from the end of the 11th to the middle of the 12th centuries. A large Buddhist monastery of five enclosures. Unrestored and deliberately left to the elements with dramatic results though many of the large trees which give the temple its character are dying. Dedicated to the mother of Jayavarman VII, the inscription tells us that within the walls were 12,640 inhabitants of whom 13 were high priests, 2,740 officials, 2,232 assistants, and 615 dancers. Best in the morning. A large basin (the royal bath), 700 meters by 300, set on the axis of Banteay Kdei and bordered by stone steps. Originally excavated during the mid 10th century, to its west is an elegant terrace, and nearly at its centre small islands on which there are some sandstone remains. A royal city forming a rectangle of 700 by 800 meters surrounded by a moat and similar to Ta Prohm, but with only four enclosures. 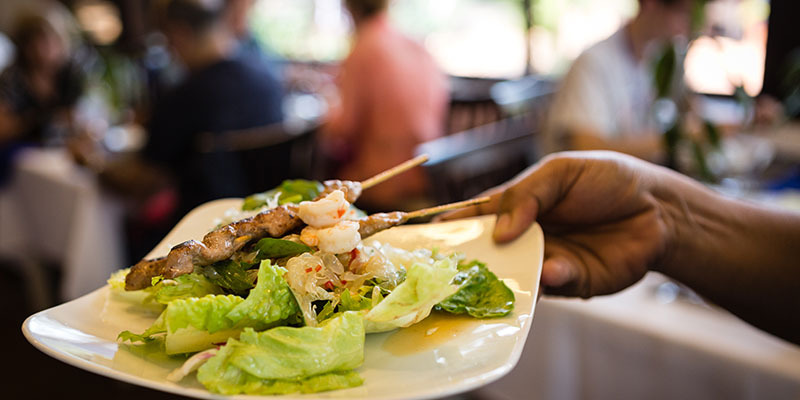 Opens to the east to a baray (at the centre of which is Neak Pean) via a terrace originally used as a boat landing. The large stele, discovered in 1939, tells us that the temple was dedicated to the king’s father. 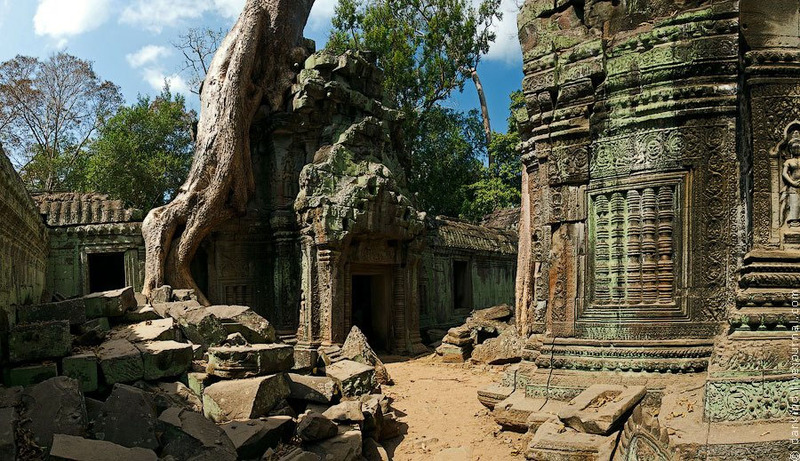 It also refers to the small stone building within the fourth enclosure to the east (like the one at Ta Prohm) as ‘a house of fire’ – perhaps for visiting pilgrims. The many small holes in the stone of the central sanctuary could perhaps have been used to fix a bronze paneling. Larger holes seen elsewhere were generally used for lifting. Good at any time. ‘The entwined naga’. 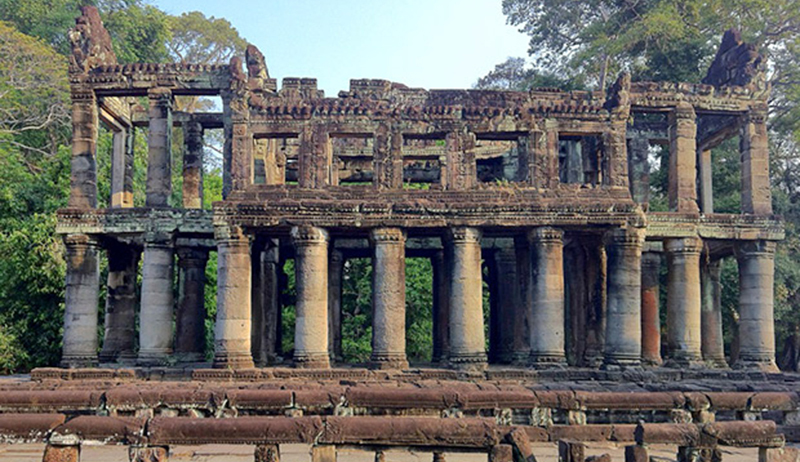 Built as an island, 350 meters square, in the middle of the Preah Khan Baray. A square central basin has at its centre a circular base for the sanctuary ringed with two entwined nagas (serpents). Four gargoyles in small sanctuaries discharge into smaller square basins to each side in a form which replicates the sacred lake of Anavatapta in the Himalaya, venerated for its powers of healing.